Wild Ride in the Sky is an e-Reader level for Super Mario Advance 4: Super Mario Bros. 3. The level contains four Advance Coins and its official difficulty rating is ★★★☆☆. This card was released as part of series 1 in Japan, and was bundled with all but the latest versions of the game in North America. Some of the enemies faced in this level are Bullet Bills and Koopa Troopas, the level also features the diagonal Bullet Bill generators from Super Mario World. The Japanese key art depicted Wendy O. Koopa, while the English key art depicted Mario and Luigi marching and hat-tipping. As the name would suggest, the level takes place high in the sky and the majority of the level consists of navigating moving platforms while the screen auto scrolls. The A-Coins mostly lie on low cloud platforms. Take a wild ride in the sky! Think you can nab all the coins? Not if Bullet Bill has anything to say about it! Kowagatte bakari ja sora ni oitekebori da yo! Seizei ganbari na! "Just acting scared will get you left behind in the sky! Do your best!" Ōzora de asurechikku! Athletics in the Skies! 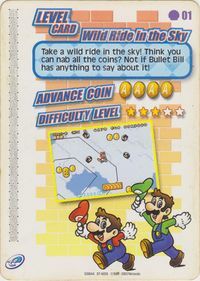 This card was included as a bundle with the Super Leaf card in the first releases of Super Mario Advance 4: Super Mario Bros. 3. Later releases did not include these cards due to the e-Reader being discontinued, however, the game had still support for said device.